The following is based on a true story, however the work below is a product of my own imagination. Read the afterward to find out the actual events that took place and inspired the story below. He gripped the railing tightly, grinning into the wind that rushed over him. He ran his tongue over his lips, tasting the salt that had settled finely over his skin from the ocean spray. In his entire life, he had never been on such a journey. Only ten years of his life had passed so far, but this was a dream that he had been waiting to happen for over three years. Ever since his father had left him and his family. It had crushed him at first, not having him there every day, not having him in their lives, but John knew that his father was doing it all for them. Chances took bravery. He tried to follow his father’s lead. He did his best to make sure that he did well in school and helped his mother with the house and chores. Every time he wanted to complain, he bit his lip and thought of the difficulties that his father faced every day: being away from his family, living in a foreign land, and working hard so that his family could join him one day. That day was finally here. Three long years of waiting were over. The last time he had seen his father was nearly a year ago. He had come for his annual visit that, in John’s opinion, was always far too short. But along with the small gifts that always accompanied him, he had brought a promise. A promise that they would be with him soon, that their family would be reunited again. When he left he had also left John’s mother with a gift. One that would not arrive for nine months. John turned his back to the expanse of water that spread into infinity and leaned his back against the railing. From here he could see his mother, Karoline, rocking Emma in her arms. At only two months old, she didn’t do much other than cry and eat, but he still adored her. The same could not always be said about his other sisters and brothers. Herman and Henry were younger than he was, so they usually looked up to their brother with reverent eyes, but they were often in his way and underfoot. Kristine, who was four years older, was more into dresses and boys than anything else. And Jacobine had entered that terrible two stage, as his mother called it, so she could be sweet and endearing one moment and terrifying the next. He tried to avoid her wicked mood swings whenever he could. He’d rather deal with his older, love-crazed sister. Even though the thought of being an only child was tempting on some days, especially when they all relentlessly teased him with his given name of Sofus, he would have never given up his family for anything. He was thrilled that their family would be all together in only a few short days. Leaving Denmark and saying goodbye to all of his friends had been the hardest thing he’d ever had to do. But he would have such amazing stories to share with them. How they had their own deck to walk out on and watch the ocean pass by. How their sleeping rooms had soft pillows and fresh linens that were changed every day. How the dining room had cloth tablecloths and real china plates. They were traveling to America in style. He had heard about other ships, where the third class passengers had to share cramped rooms, bring their own food for the trip, and restrict themselves to their cabins. Being stuck in a tiny room for ten days would have driven him crazy. Not to mention Karoline surely would have throttled them all before they ever got close to being in America. They were lucky that they were on this ship at all. As usual, their large family was running late and missed the small vessel that would have taken them to the ship that would cross the Atlantic. His mother had rushed into action and had been able to book different passage for them all after spending quite some time on the phone, and they were off to Copenhagen to meet their new ship. Seeing that his mother had everything well in hand with Kris by her side, he scooted sideways along the railing until they were out of sight. The ship was safe, his mother had said, so he often went exploring. The mechanics of how a ship that was over five hundred feet long and ten thousand tons could charge so powerfully through the water astounded him. The Hellig Olav was small compared to the other ship that was supposed to carry him and his family to America, but that didn’t bother him. Early in their voyage, he and a couple of the other boys his age had found the engine room. They had shouted at the top of their lungs, but could barely hear each other over the noise. Sweat dripped off of the men who worked the heavy equipment, their muscles straining with the effort. Some of the workers had yelled and told them to get out of their way, but others had grinned and let them watch. They had even let John shovel coal into the jaws of one of the great furnaces. In just a few short hours, those massive engines would have them pulling into port. He would finally see what his father had described to him so many times. The coast stretching up to meet them, the great amounts of people waving and cheering as they approached the dock, the statue of the beautiful lady holding her torch high. His father had sworn to him that she was made of copper, but John hadn’t believed him at first. He didn’t believe that such a great statue could change and turn green over the years. It wasn’t until his father had brought him back an American copper penny, and put it in a small dish of vinegar and table salt, that he believed. He could hardly argue that his father was playing a trick on him after that after watching it happen in front of him. He spotted George and William and made his way over to them. They had become fast friends after playing chase in the corridors of the staterooms that had become their temporary homes. He had almost reached them, when he felt a firm hand grip his arm above the elbow and halt his progress. He whipped around, sure that it was one of the bullies from second class about to give him a hard time, only to see his sister standing there with an exasperated look on her face. “Mother wants everyone down in the room to rest before we arrive.” She pulled on his arm, tugging him back the way he had come. “I’m not a baby, I don’t need a nap,” he retorted. Just because Kris was older, she thought she could act like she was in charge of everyone. John looked over his shoulder and shrugged apologetically to the boys. He wrenched his arm away from Kris and rubbed at the marks he was sure were underneath his shirt. He only had a few hours left on the ship. The last thing he wanted was to go back to the stateroom and stare at the walls. But he wouldn’t want to disappoint his mother, either. He wiped the grimace off his face just as she came into view. Three hours later, with his arm slung about the George’s shoulder, he watched in awe as Lady Liberty loomed large over them as they made their way to the port. He eagerly searched the crowd for any signs of his father, who had come all the way from the state of Wisconsin to greet them, but he could not spot him. The boys waved and shouted, but were disappointed to see that no one was waving back. As they eased into place at the dock, most of the people were scanning the faces at the railings for long awaited loved ones, but their faces held something other than the eager happiness the boys expected to see. Something that John did not understand. Fear. Grief. He frowned and left George standing by his own family. Something twisted and gripped his insides and he slipped his hand into his mother’s reassuring one. She looked as confused by the reaction of the crowd as everyone else standing by the railing, but she smiled down at him and squeezed his hand. Now that the ship was in place and the crew and dockworkers were readying the ramp for them to leave, he could see that some of the people on the dock were actually crying. He was about ready to ask his mother, but she just shook her head at him. She didn’t know. She wouldn’t, having been on the ship with them. John leaned in closer to her side. He wasn’t sure what was going on, but the tired, sad faces that greeted them scared him. It seemed to take a lifetime, but they were finally ready to move off the ship. He had finally seen his father, but instead of waving enthusiastically at the joy of seeing his family, Soren merely nodded and lifted his hand briefly before letting it fall back to his side. His clothes were badly rumpled and dirty. He had never seen his father in such a disarray. John shuffled at his mother’s side as everyone took their turns making their way down to the dock. There were so many people trying to get to their families that it seemed as if another three hours had passed before he was in his father’s arms. There was a wetness on John’s cheeks and he realized that his father was crying. He had never seen his father cry before. And he could tell that it was not from happiness. The sun was shining brightly, but the air around them was heavy with despair and horror. Even as he greeted all of his children, Soren’s arm was wrapped tightly around his wife’s shoulder. It did not look as if he intended to let go anytime soon. He guided them away from the crowd, towards a small bench where they could sit. As they passed through the reunited families from the Hellig, whispers and low murmers reached his ears. John had heard of icebergs. When he was in the engine room, he’d heard one of the men talking about running the engines slower than normal because of warnings they had received. When he had tugged on the man’s suspenders and asked what he meant, the operator’s eyes hardened and explained about the massive floes of ice floating in the ocean, how most of the ice was hidden underneath the surface of the water. It didn’t sound likely to John, but the look in the man’s eyes left no doubt that they were not something to be messed with. He figured they had to be deadly serious, enough to warrant slowing down the ship’s speed and delaying their arrival to New York by two days. His father gathered them around the bench, letting Karoline sit with the baby in her arms, while he struggled for words. He explained how only three days before there had been a horrible accident. That a ship had struck an iceberg. That it sank. That over half of the people on board did not survive. His father sank to his knees and buried his face in his wife’s skirt. John could see his chest heaving, and he crept over and gave him a hug. Soren grabbed him and held him hard against him, rubbing his cheek against his son’s hair. He took a deep breath, lifted his head, and continued with the story. John couldn’t believe it. The Ship of Dreams, the unsinkable ship, was lost forever. Below the very waters that he had just himself crossed. During the great adventure, he had not once been scared or nervous to cross the mighty Atlantic. Now the flesh on his arms began to crawl as if there were bugs nesting just beneath the skin, and he shivered. For three days, people on Ellis Island had desperately been searching amongst the survivors for their own kin. They wished and hoped and prayed that the news was wrong, that their families were out there somewhere. That their sons and daughters, wives and husbands, mothers and fathers would miraculously appear to them and wake them from the nightmare they were all sharing. For three days, Soren had grieved. His father had searched for them relentlessly. He refused to believe that they were gone, that they weren’t coming back. When the days crawled by and still no word came, his hope flickered and was extinguished. Until the passenger list was released. That’s when he discovered that his family had not been on the ship at all. So many times he had been frustrated and angry with his wife for running late, but now he swore that he would never harp on her again. By running late, they had missed their booking on the Titanic. One of his wife’s chronic behaviors that he had always found fault with, had saved his entire family from certain death. John watched as his father gathered his strength and stood, pulling his mother to her feet as well. He rubbed the back of his hand across his eyes, trying to wipe away the tears that did not want to stop. He clenched the bottom of his father’s coat in his fist, not wanting to let go. He didn’t ever want to let go. His eyes strayed to the people who were still wandering around the buildings with lost, dazed looks in their eyes. He gripped the fabric in his hand tighter as they all walked away from the pain and sorrow that clung to the faded souls that wandered around them. John had enough adventure. He was ready to go home. They would all be going home. This story was purely of my own speculation of what it may have been like for my great-grandfather to travel across the ocean with his family. Only to find out that by mere chance, their lives were spared one of the great tragedies of our time. 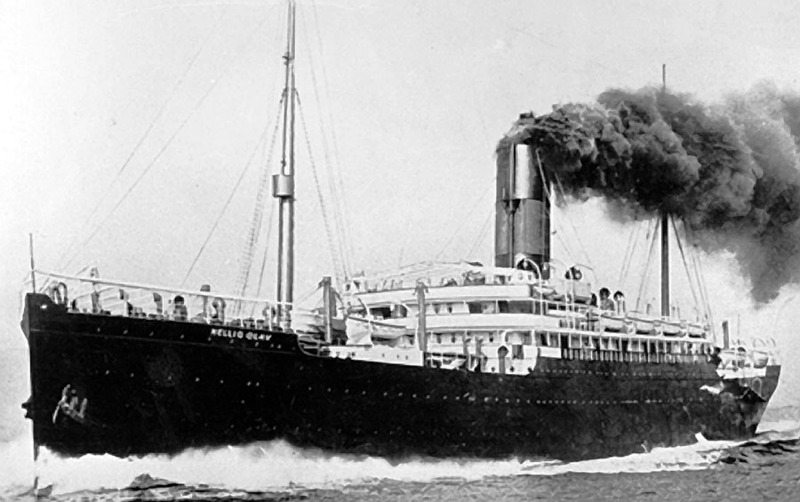 The Jensen family ran late that day and missed a small ferry vessel that was to take them from Denmark to where they would travel to one of Titanic’s passenger ports. Hellig Olav records show the listing of the Jensen family: Karoline 39, Kristine 14, Sofus 10, Herman 9, Henry 5, Jacobine 2, Emma 2 months. Hellig Olav arrived in New York on April, 18th, 1912. Titanic sank April 15th, 1912. When the Titanic sent out distress calls, the Hellig Olav was approximately four hundred miles away. Second Officer Frederick Mecklenburg on the Hellig Olav, who as on watch that night, estimated that it would have taken twenty-six hours to reach the Titanic. Far too late to be of any assistance. Wireless Operator A. P. Anderson said he received a message from the Olympic at 12:30 o’clock Sunday night. This message said the Titanic has struck an iceberg and there seemed to be no danger. He was not able to reach the Titanic by wireless. Anderson says he first obtained news of the liner’s sinking from Cape Cod on Tuesday night. He never received a call for help, he declared. Call To Arms Fellow Indies!